Whirlpool Duet HE Front Loading Washer Error Codes. 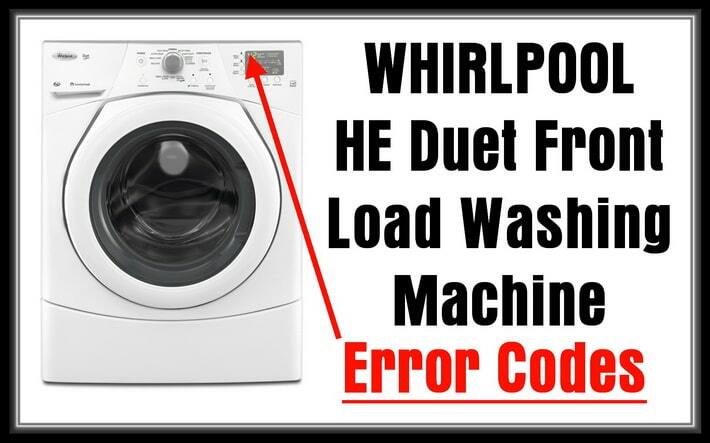 The following error code list explains each error code that can display on your Whirlpool HE Duet Front Load Washing Machine. The videos below will show you how to get into diagnostic mode if needed. 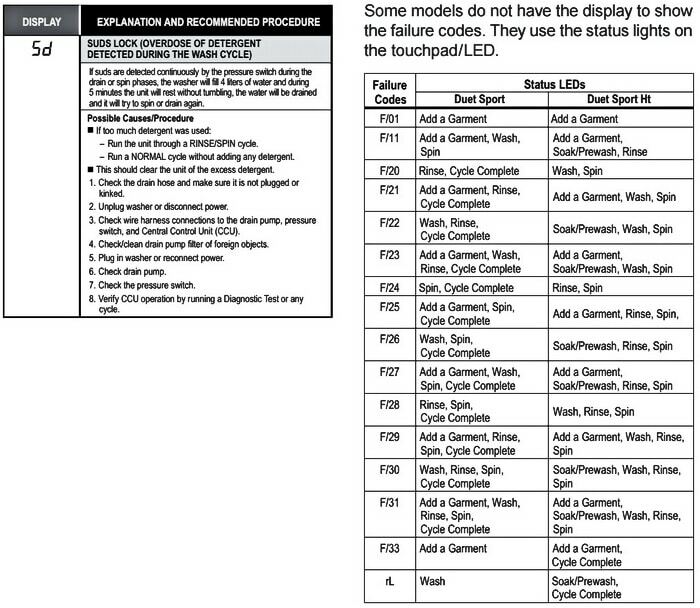 Be sure to use the following error codes with the correct model number Whirlpool Duet Front-Loader Washer. 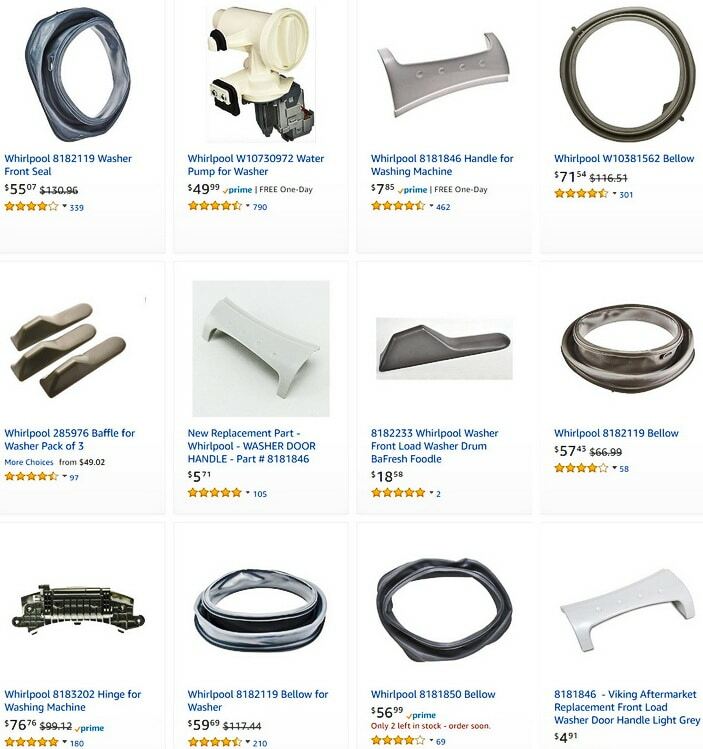 Here is the Whirlpool Washer Service Manuals & Literature page, simply enter your washer model number for the full PDF manual. More Whirlpool Washer error and fault code pages here… Whirlpool Duet Washing Machine Error Codes – Fault Code Definitions, Whirlpool Washer Front Load Error Codes – What Does Error Code Mean And How To Fix, Whirlpool Cabrio Washing Machine Error Codes, Whirlpool Washing Machine Error Fault Codes, Whirlpool Washer Error Code F21 – DRAINING ERROR – How To Fix, and Whirlpool Duet Washer Error Code E01 F09 – How To Fix – How To Clear. NOTE: Remember to remove power to your washer before any troubleshooting! Whirlpool Error Code Explanation: Long Drain – The drain time has exceeded 8 minutes, the valves turn off, and the drain pump will stop. -Check that the drain hose is not blocked or kinked. -Be sure drain hose is not sealed into drain pipe. -Check that the drain hose height does not exceed 96″. -Check and or clean the drain pump filter. -Check connections on pressure sensor. -Are both water supply valves behind the washer fully open? -Check the drain system for a siphon problem. -If the water inlet valve assembly is faulty simply replace it. -The washer cannot drain extreme sudsy water. -Unplug the washer and check the large item filter in the drain pump for a blockage. -If the drain pump is defective simply replace it. -Unplug the washer and check the wiring going to the water temperature sensor. -If the wiring is sound then replace the temperature sensor. -Unplug the washer and check the wiring between the motor control board and the drive motor. -Check the wire harness connection between the motor control board and the main control board. -If the wiring connections check good, the drive motor or the motor control board may be faulty. -The drain pump runs constantly in an effort to drain the water. -Unplug the washer and, if the washer is overfilled, check the water inlet valve assembly for proper shut-off of water flow. -If the water inlet valve assembly is defective simply replace it. -If the washer is empty when this error code appears then replace the water-level pressure switch. Check / Adjust / Clean / Replace: Water inlet valve assembly – Water-level pressure switch. -Unplug the washer and check the wiring connections on the motor control board. -Check the drive system for problems. -If the wiring and the drive system are sound, the motor control board usually needs to be replaced. -Check the connections on the main control board, motor control board and drive motor. -If there are no connection problems, the motor control board and/or the main control board may need to be removed and replaced. -The dispenser can’t move into position. -You will hear the dispenser system shifting before this code is shown. -Unplug the washer and check the mechanical linkage on the dispenser housing. -Repair or replace any damaged parts. -The Electrically Erasable Programmable Read-Only Memory (EEPROM) on the main electronic control board is corrupted. -Unplug the washer for 5 minutes, restore power and see if the code clears. -If not then replace the main electronic control board. -Check the wire harness connections on the motor control board. -Make sure that the drive motor connections are secure. -If there’s no wiring connection problem, the motor control board may need to be replaced. -If you see excessive suds in the washer start using the proper high-efficiency (HE) detergent. -Check the door lock assembly for damage or a loose wiring connection. -If there are no issues, you may need to replace the door lock assembly. -If there are no problems, you may need to replace the door lock assembly. Need help? Leave a question below and we will assist. I have pulled popped the hood and on all the wiring harness connectors used ‘switch cleaner’ on all the connections thinking it was maybe a croided socket/connector, pulled all the connectors off one by one and used CrC Switch Cleaner, and reinstall plug(s) to there married sockets. I also looked in the ‘Catch trap’ there was nothing in there apart from some water in the pipe. Reinstalled cover to Trap. put machine upright plugged in, hit pwr on and no errors… runs fine for 2 days. On the 3rd day I get Beep Beep Beep…. Beep beep beep… F05/E02 Beep beep beep. Beep beep beep. F02/E02 flashing on the display again? What’s the issue would possibly be? 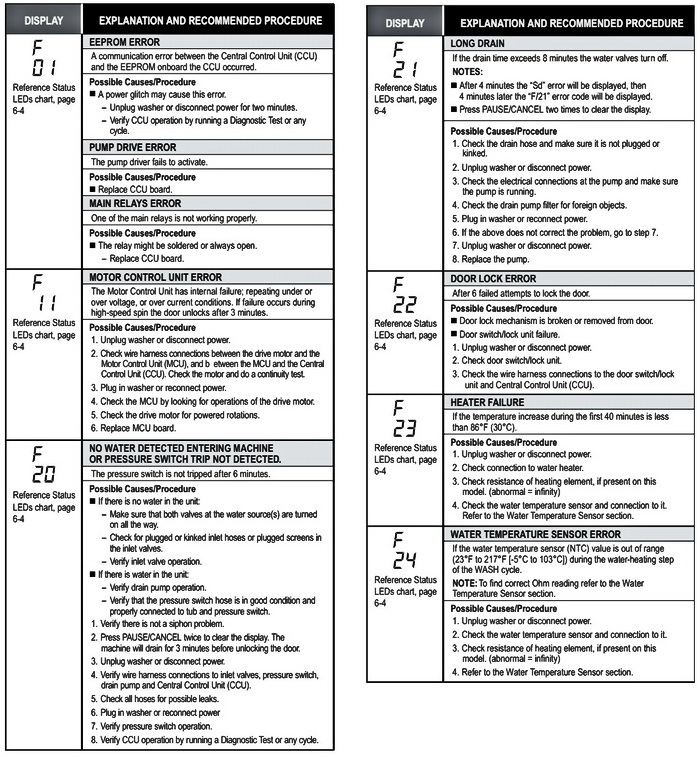 Previous post: LG Refrigerator Error Code Er FF – How To Clear?